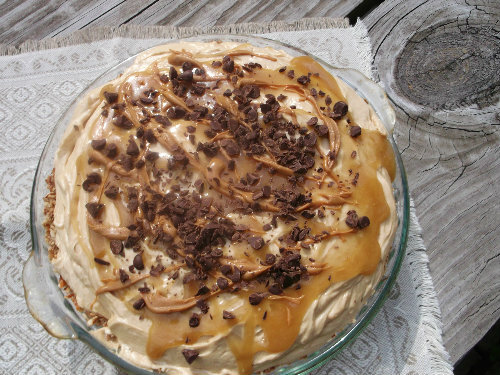 Who doesn’t love peanut butter, caramel, chocolate and pretzels? Okay, I am sure there are many of you out there that would say yes to one of these ingredients. So this pie is not for you, including my Mike, he doesn’t like peanut butter. But if you like these ingredients then this pie will definitely be one that you would love. This was one of the desserts that I made for my daughter Lisa’s birthday last week. She had asked for a yellow cake with chocolate frosting. The cake is easy enough to make and she loved it, but this cake is not one of the favorites in my family. So being the person that I am I wanted to make everyone happy, so I made this delightful pie. My son-in-law Doug told Lisa that this pie was the best pie he had ever eaten. I don’t think that you get a better compliment that. I have submitted this pie to the Zuuzs Grand Spring Recipe Challenge. You can go to zuuzs.com to vote for my pie. The voting will begin in a day or two, I have been told that they are working on it. I will update this post once the voting has begun. So if you have a minute and would be so kind to go to zuuzs.com to vote for me I would really appreciate it. I do want to let you know you will have to sign up at zuuzs.com in order to place a vote. Combine finely crushed pretzels, sugar, and melted butter in a 9 inch pie pan, mix well and press firmly into the pan. Bake in a 350 degree oven for 7 to 10 minutes. Set on cooling rack and cool completely. In a small saucepan bring whipping cream to a simmer. Once the cream comes to a simmer remove from heat, add milk chocolate chips. and light corn syrup. Cover and let set for about 2 minutes. Beat the chocolate, cream, and light syrup until smooth and glossy. Pour this over the cooled crust and refrigerate until the chocolate is cooled and set. In a large mixing bowl beat cream cheese (make sure the cream cheese is room temperature) until fluffy. To this add the peanut butter, vanilla, butter, and powdered sugar. Beat all ingredients until well blended and fluffy, set aside. In another large mixing bowl beat whipping cream until stiff peaks form. Fold the whipped cream into the peanut butter mixture until well blended. Pour over the caramel layer. 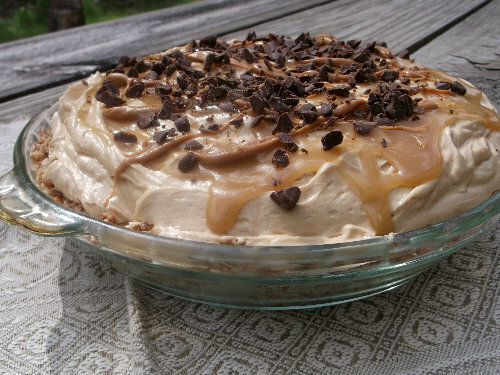 Drizzle over top of pie with the remaining caramel (this may need to be heated a little until it is runny enough to pour), then drizzle 3 tablespoons of melted peanut butter (melted in the microwave until slightly runny), and sprinkle with 3 tablespoons of chopped milk chocolate chips. Freeze 3 to 5 hours before serving. My kids would be so thrilled if I made this for them. What a great combination of ingredients! 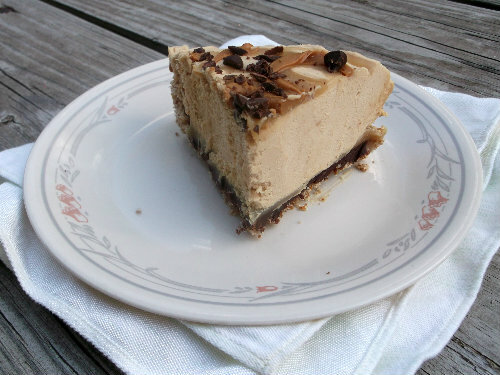 What a delectably delicious pie! I love all the components you put together! Insane.